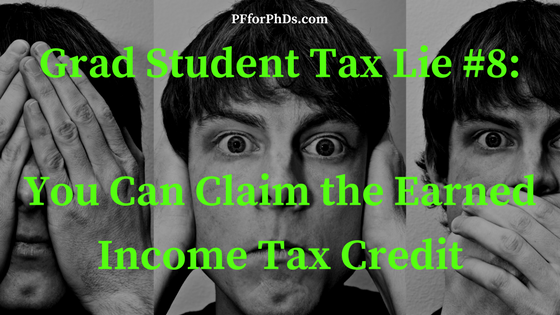 Grad Student Tax Lie #8: You can claim the earned income tax credit. Tax credits are amazing, and you should definitely claim as many of them as you can. While a tax deduction reduces your taxable income, a tax credit directly reduces your tax due. A deduction of $2,000, for example, is worth $2,000 x your marginal tax bracket. Many grad students are in the 15% tax bracket (or lower), so a $2,000 deduction is worth only $300 for them. A tax credit of $2,000, on the other hand, is $2,000 directly knocked off your tax bill. Some tax credits can be refunded to you, meaning that instead of paying tax for the year, you are given money! You have to have a pretty low income to qualify for the EIC (adjusted gross income < $14,820 for a single person without children), but plenty of grad students fall into those income brackets, especially if they have a dependent spouse and children. The catch for grad students, though, is right in the name of the credit. Eligibility for this credit depends on having earned income, which is bad news for grad students who receive fellowship pay (aka non-compensatory pay). Rule 7 states that you need earned income to claim this credit. If you have an assistantship, you have W-2 pay, which is earned income. If your spouse has a real job or is self-employed, that is earned income. But if your only household income is from a fellowship or scholarship (reported anywhere other than a W-2 or not reported), that is not earned income, and you will not be able to claim this credit. See the tax lies home page for a full list of tax lies that graduate students should not fall for. We at Personal Finance for PhDs are not tax professionals, and none of the content in this section should be taken as advice for tax purposes. I’m still confused by this. You say that even if the “Adjusted Gross Income” (which I think should include the ~$30,000 scholarship stipend many graduate students receive) is larger than the limits for EIC, you can still qualify for EIC if your “Earned Income” is below the limits (i.e. say you make $3,000 as a TA). But 1. my tax software doesn’t seem to allow this, and 2. From reading the Step 5 instructions and Worksheet A, Part 1, on p 59 (https://www.irs.gov/pub/irs-pdf/i1040gi.pdf), it seems that if even only the Adjusted Gross income is above the EIC limit, you don’t qualify for EIC. Can someone clarify? $39,131 ($44,651 if married filing jointly) with one qualifying child. So should AGI include the full scholarship (which will surely be above $14,820)? You know what Hannah, I think I made a mistake in tacking on that last paragraph to the post. It looks like fellowship/scholarship income is excluded from the earned income calculation, but as you said AGI is still taken into account when calculating the credit itself. It’s not clear to me why the earned income calculation is needed if they are just going to use the AGI to calculate it (except to exclude people who don’t have earned income, I guess)! I’ll read about this a bit more and correct the post as needed. Thanks for catching this and contributing your comment – I’m sorry to have gotten your hopes up! I removed the “good news” paragraph from the post. Thanks again for your comment, Hannah! We’re not tax professionals over here so this kind of correction is very helpful. I’ll leave your comments up for a while in case anyone else was confused by the older version of the post.